If you are looking to improve your baseball or softball game, an excellent way to do so is by using a good pitching machine. The great thing about pitching machines is that they help you practice hitting on your own. You don’t need a partner, a coach or a team to practice hitting when you have a pitching machine. This means that you can practice anywhere with a decent amount of space, and anytime you want. For players truly committed to improving their hitting, pitching machines are an excellent option. Pitching machines come in a huge range of variety. They vary depending upon many factors such as the speed of the balls pitched, the overall weight and portability of the machine, and the price tag. If you want to get a pitching machine, you may be confused by the sheer variety of such machines available on the market. From well-known baseball and softball brands to relatively obscure companies, a huge number of pitching machines can be purchased both online and offline. Amidst all this, it can be somewhat hard to determine which pitching machines really deliver the right performance and are worth their buck. To make things easier for you, we have shortlisted the 5 best pitching machines that are sure to help you improve your performance. Below are brief reviews and a quick overview of their pros and cons. We hope these reviews will help you find the machine that best suits your needs, budget and other preferences. The Louisville Slugger UPM 45 is one of the best pitching machines out there, particularly well suited to younger players aged 6 and above. This machine is officially used in the practice sessions of Pony Baseball as well as the Babe Ruth League. The primary reason for this is the sheer versatility and ease-of-use that comes with this machine. The machine weighs only 25 pounds, which means that it’s incredibly easy to move it around, so its portability is a huge plus. It can easily pitch baseball, softballs and a wide range of other balls. The speed range for hard balls is between 18 mph and 45 mph. When throwing more light-weight balls, such as softballs or plastic balls, the machine can throw at speeds up to 60 mph. Teachers, coaches, and parents who use the machine to train the younger players can easily tweak the settings and adjust the pitching speeds exactly according to their needs. The UPM 45 machine also comes with settings allowing the coaches and parents to determine what type of pitch should be thrown. The machine can throw level pitches, fly balls, grounders as well as perfect strikes. The sheer versatility of the pitches offered by this machine makes it perfect for rigorously training the younger players in their hitting performance. Another stand-out feature of the UPM 45 machine is that it needs absolutely no battery, electricity or any other power source to operate. The machine is complete manual, so you don’t have to be wary of any maintenance woes on its part. To top it, the machine comes with a very affordable price tag, making it one of the most budget-friendly options out there. Louisville Slugger has long been a brand which is reliable and offers top-quality products related to softball and baseball. The UPM 45 machine from the company is no different. The machine offers a solid punch in terms of performance, is incredibly easy to use, comes with all the essential features and doesn’t tax your pocket too much. 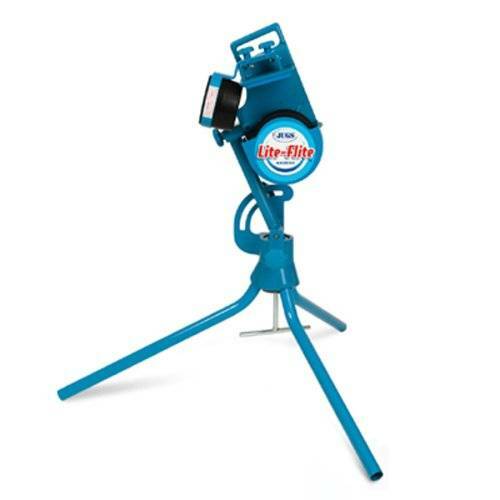 The JUGS Lite-Flite machine is another great option when it comes to pitching machines. The company behind this product, JUGS Sports, has long been known as a manufacturer of quality equipment for baseball and softball players. And this commitment to quality is well-manifest in this machine. 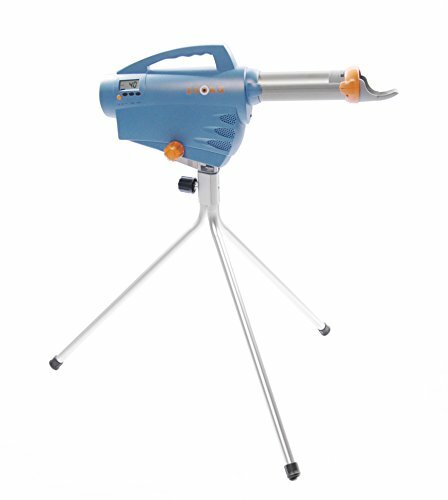 The Lite-Flite machine has a relatively light-weight profile and offers a decent amount of portability. It comes with a huge range of features, making it almost at par with big league pitching machines. The machine can be used to throw only baseballs and softballs. You can use the machine to pitch balls with speeds as high as 85 mph, even at a distance of 25 feet. This makes it perfect for coaches and parents to help their young ones practice hitting incoming balls at all range of speeds. The machine’s design allows easy adjustment of the pitching speed so that you can ensure that it pitches exactly at a speed that you desire. When it comes to pitching types, this machine is truly a winner. It can easily pitch curveballs, sliders, and fastballs apart from regular pitches. You can even choose right-handed or left-handed pitching on the machine. The machine can also simulate ground balls, pop-ups, and fly balls. This makes the Lite-Flite machine a great option for players who have a defensive style and wish to practice defense. The machine has a design that allows for exact customization for baseball and softball pitches. If you want the machine to throw softball pitches, you simply have to tweak the Switch-and-Play knobs, and the machine will start pitching in softball mode. Although slightly more expensive than the UPM 45 machine above, this Lite-Flite machine justifies the price tag by being a league apart in terms of performance and design. The machine is certainly one of the best options available on the market. It is particularly well-suited for team practice, given the sheer range of pitching options available. Lightweight pitching machine for honing swings of up-and-coming hitters. 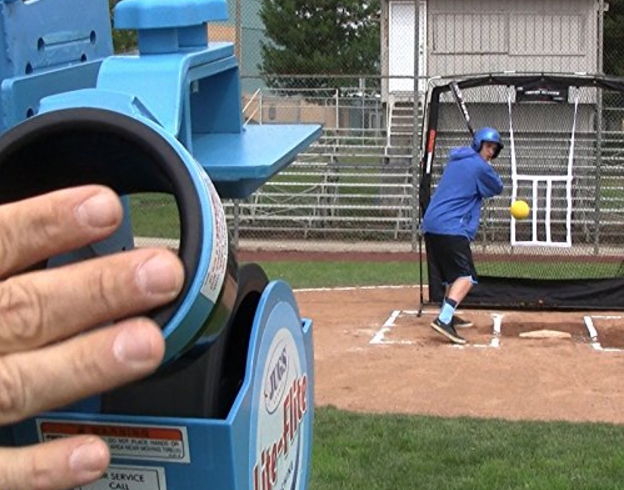 The Heater Sports Baseball machine is another pitching machine to have made our list. 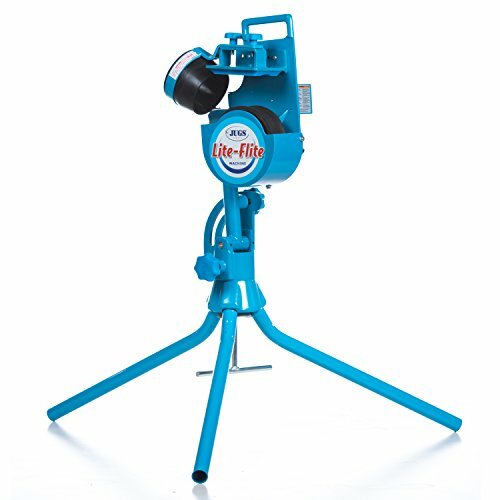 This machine comes with a solid reputation and has long been counted among the most popular pitching machines. The Heater machine comes with a stand-out design, making it look like a futuristic laser beam, which adds a certain cool factor to the machine. That is not to say that the machine scores any less in terms of performance. 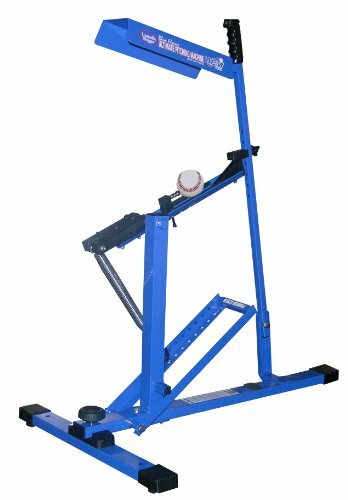 Instead, the machine comes with a wide range of pitching tools and options which makes it perfect for baseball and softball practice sessions. One of the unique features of the Heater machine is the automatic 12 ball feeder. This feature is perfect if you want to practice solo. All you have to do is feed in 12 balls in the automatic feeder, and the machine will start pitching these balls 12 seconds apart. So you can easily practice hitting without having to re-feed the machine or requiring someone else to do it. The Heater machine can pitch both regulation type leather balls as well as more lightweight practice balls. If you want to practice hitting without fearing the rather heavy leather ball, you can go with the practice balls. On the other hand, if you really want to get a feel of real baseball hitting, you can choose leather balls. The Heater machine comes with the option of pitching leather balls or practice balls at speeds ranging from 10 mph to 50 mph. This means that the machine is very well-suited for players as young as 5 and as old as 16. It has 10-speed dial options, allowing you to set a speed that exactly suits your needs and preferences. The height of this pitching machine can also be tweaked and adjusted. This means that apart from throwing level pitches, the machine can also be used to pitch grounders and fly-balls. As a result, you can use this machine for defense practice as well. The machine runs directly on electric supply, consuming a 110V current supply. Alternatively, you can use a generator with a power output of 350 – 400 watts to get the machine running. The Zooka ZS740 is a first-of-its-kind pitching machine that comes with sophisticated digital controls. In a market saturated mostly with manual machines or machines with old-fashioned controls, the ZS740 is a very smart choice and very well-suited for those who are looking for a more modern take on pitching machines. The ZS740 machine can throw pitches at speeds ranging from 10 mph to 65 mph. The digital controls on the machine allow you to easily tweak the speed settings and set the exact pitching speed that you need for the practice session. The same digital controls also allow you to tweak the height of the pitch, which means that apart from throwing level pitches, the machine can also throw grounders and fly-balls. As a result, you can also use this machine for defense practice. Another stand-out feature of ZS740 is that it can operate with all its features and functions on a rechargeable battery. This affords the machine a kind of portability that is never seen in other non-manual machines. All you have to do is charge up the battery, and once it’s full, you can take the machine anywhere for a practice session. Once charged fully, the battery enables the machine to deliver up to 500 pitches which are more than enough for a single session. The overall design of the ZS740 makes it a truly modern machine. With a sleek outlook, well-covered parts, and absolutely no dangerous parts hanging around, the machine is incredibly safe to use and has an elegant outlook. This makes the machine a perfect choice for parents and coaches who are wary of pitching machines with dangling chords, exposed parts, and other hazards. The machine also comes with a panning tripod, allowing you to rotate it 360 degrees in real-time. You can choose the height of the tripod when purchasing the machine. It is worth noting that the ZS740 has a slightly steep price tag, compared to some other products on this list. However, it is perfect for use as a team-practice machine. In fact, given its portability, durability and sheer versatility, we can safely say that this is absolutely one of the best pitching machines for team practice. 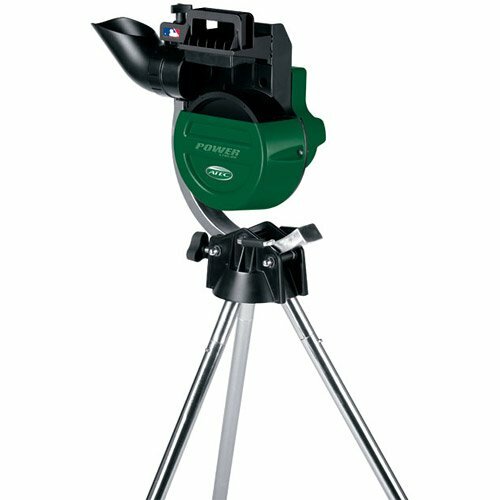 First Battery Powered Pitching Machine With a Punch! Adjustable from 10-70 mph. The ATEC Power Streak baseball pitching machine is another excellent option. 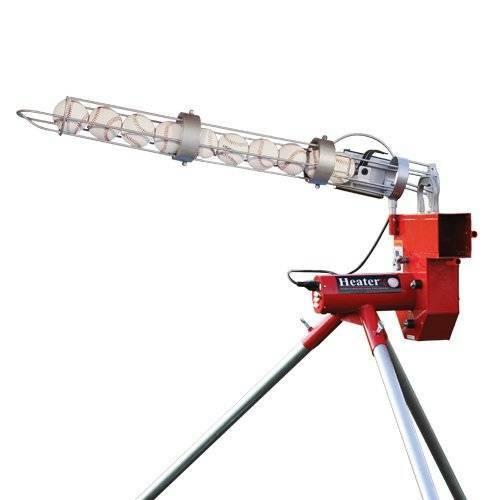 ATEC has a reputation for building pitching machines which are consistently accurate and are preferred by professional players. This reputation is reflected in the ATEC Power Streak machine as well. The machine can throw baseball, softballs, and mini-balls. However, you have to use the specific SFT balls which come with the machine. When pitching the balls, you can adjust the settings of the machine and determine the speed anywhere between 30 mph and 60 mph. The machine has an innovative design which allows you to adjust the height of the machine. As a result, the machine can throw level pitches as well as grounders and fly-balls. This makes it perfect for use in defensive training as well as hitting practice. The Power Streak machine weighs only 30 pounds, making it one of the most light-weight machines on this list. The machine runs on a 110V power supply or can be alternatively be powered up using a 600W generator. With a sturdy design, solid performance, a moderate price tag and a 1-year warranty, the ATEC Power Streak is certainly one of the top pitching machines on the market right now. When finding the right pitching machine, you have to consider your personal needs and preferences. Do you want the machine for individual backyard practice or proper team practice? Do you want a machine that is portable or can you do away with portability? Do you have a specific budget range? These questions will determine which pitching machine is ultimately the right choice for you. The Louisville Slugger UPM 45 and the Zooka ZS740 are both portable options. If you don’t need to move around the machine, you can go with the other non-portable options on the list. Similarly, if you want a machine that is completely manual, the UPM 45 makes the cut well. On the other end, if you want a fully digital pitching machine, ZS740 is the way to go. If you are looking for alone practice, the Heater machine with its automatic feeder is a very convenient option. At the end of the day, your requirements and preferences will determine the perfect pitching machine for you.